He’s been studying the wider reach of algorithms in society, government and industry for about four years, coming at it from a computer science background as a “techie who worked my way into journalism.” Boyish, bespectacled and occasionally prone to professorial turns of phrase like “algorithmic accountability,” Diakopoulos offered a look into the numbers that shape our lives. Photo: Jon Oropeza via Flickr. CC-licensed. These break down broadly into four types of decisions: prioritization, classification, association and filtering. Familiar examples include search engines top-ranking better sources of information; YouTube’s strainer for picking up copyrighted material; connecting terms—as in the slander lawsuit over Google’s auto-complete — and filtering, whereby some news sources rank higher than others. Far from being impartial gatekeepers or shortcuts, algorithms are designed by humans — often with built-in bias that can shape our daily lives. They are deciding what schools kids attend, who gets released on parole and who your next date is. That’s where algorithmic accountability — pulling back the curtain on the formulas — comes in. Diakopoulos cites a ProPublica investigation into software used in crime cases that asks a number of seemingly benign questions — “What neighborhood do you live in?” “What’s your education level?” “Are you in touch with your family?” — to arrive at a flight or future crime risk. Looking at the results in 7,000 cases, reporters discovered that the resulting “risk assessments” are not only biased against blacks but only slightly more accurate than a coin toss for predicting who will commit more crimes. 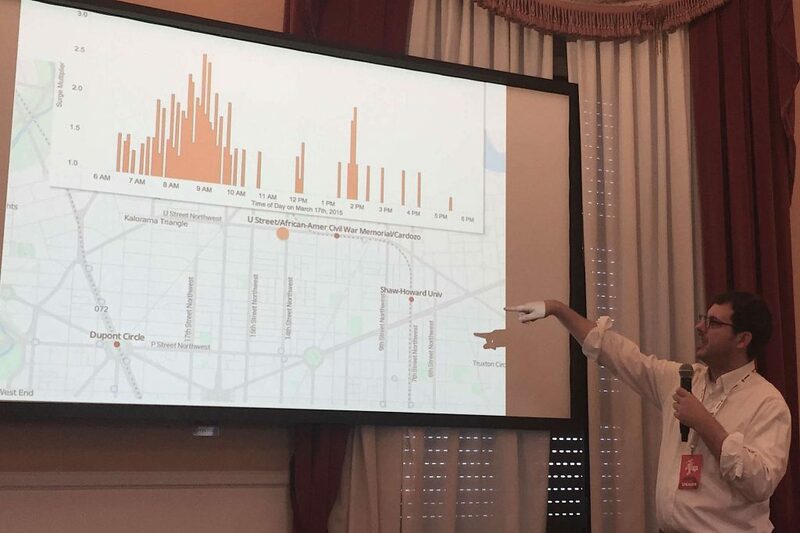 Diakopoulos shows waiting times by area in the Uber investigation. First, they amassed potentially newsworthy algorithms in use by the U.S. federal government — starting with 5,000 leads for algorithms that aren’t even talked about on the websites. Then they filtered, tagged and enriched those leads — fleshing out descriptions, why these algorithms matter, which level of government they influence, whether or not it’s proprietary and so on. They’ve got around 170 algorithms to get you started – from Zika treatment for pregnant women to highway planning and a hiring system for government employees. If you’re interested in delving into ways to Diakopoulos gave an overview of a few main ways to dig into algorithms, along with the pitfalls of each. This entry was posted in data and tagged algorithms, data journalism, international journalism festival, investigative journalism by . Bookmark the permalink.